We took a side trip back to Bangkok to meet up with our diving gear that an army of Steve’s friends were involved in, doing various logistics somersaults, to get a box out to us. We’ve met up with said baggage and can’t thank everyone that was involved enough, especially the Daves. You know who you are and seriously…we can only imagine the trouble you guys went through to make this happen and can’t figure out why you guys were willing to do it, but wholly glad that you were. So now we’re going to be on a bus to Cambodia on Christmas day. Doing research on the country you see the typical warnings like scams, malaria, and monkeys. But it’s a little disconcerting to get to the part of the world where land mines is added nonchalantly to that list. It’s a real threat apparently and the suggestions are to ‘stay on the beaten path’. Well, as far as I can figure there are only 2 paved roads in the country outside the cities and everything else is dirt. Needless to say we’ll be thinking twice before we follow a jungle path to a less visited temple. But what if twice isn’t enough? We had returned to Thailand after almost a month home in Cal ifornia. It was a last minute decision but a much needed break. When we returned to Bangkok we had the future legs of our travels to figure out. So we went out to beachy Koh Chang and Koh Kood to stay amongst the comforts of aircon, salami, and wifi for 2 weeks. For breaks we explored the island on a motorbike and played with some elephants including a napping baby Dumbo, drove through rubber plantations, and did some puzzles. 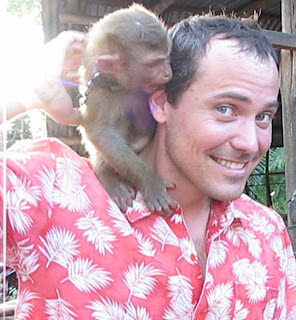 At one point Steve had to get a monkey off his back that was trying to go through his pockets and bite his ear. We were reluctant to leave but we had planned out the next six months of adventure so it was time to move on. A quick return to Bangkok to pick up a delivery and we would be on our way to Cambodia. 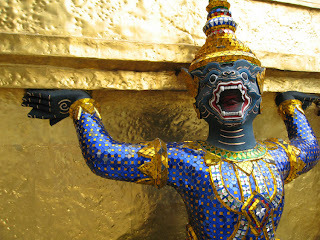 Religion is a big part of Thai life. There are always small standing shrines in front of houses and inside businesses. When this pious energy is focused into erecting temples the result is massive ornate structures of color explosion and gold leaf, always topped with pointed roofs. Or sure there’s colored glass, painted cement and terracotta flowers to fill in the spaces. You can’t miss the rows of brass buddhas smirking down at you with their heavy lidded eyes. The statues of various mythic creatures are always interesting. The half girl-half rooster is something to pause at. So is this guy but I’m not sure what it is. The old capitol Ayutthaya is a bearable 2hr train ride from Bangkok. It was a glorious temple ridden city, the center of the Thai nation for four centuries until 1767 when the Burmese sacked it. The place was left it in a ruin of rubble so the capitol was relocated to Bangkok. The locals opted to leave the battered remains as they stood as a reminder of the atrocity. 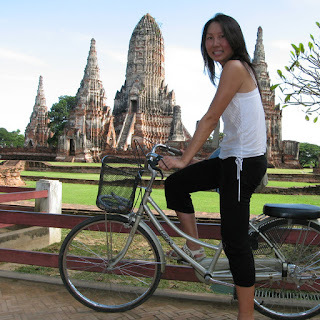 So now tourists ride around from temple to temple looking at the mostly red brick remains and beheaded buddhas. It’s a nice day trip and some good exercise if you go around by bicycle. 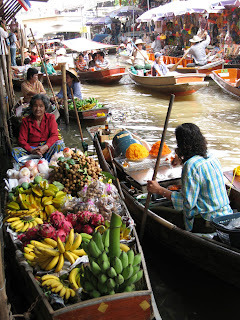 Colorful row boats of fruit, souvenirs and other tourists drift past at thefloating market; another popular day trip. Sure the people living amongst the canals may have once conducted their daily lives afloat but now it’s as authentic as the gandola ride at the Venetian. The traditional Thai massage is done on a stuffed mattress on the floor. The masseuse cleanses your feet with lime water and does a quick prayer before starting. They rub with rocking motions, elbowing your other cheeks, kneeing your back, stepping on your shoulder. They stretch you out, often in ways that you don’t normally bend. The result neither relieves nor relaxes but loosens. Coming out of Nepal our stomaches were still shriveled from our Himalaya experience. Bangkok was there to fill it back to its bloated form. There were fresh fruit juices galore. Our favorite being mango and passion fruit. There were also refreshingly fresh young coconuts, vinegary tom yum soup, the perennial favorite pad thai, succulent grilled jumbo prawns by the kilo, savory oyster omelets, and crispy chocolate banana crepes. Of course frequent trips to Swensen’s ice cream and Subway sandwiches helped too. We also found Isreali places that served good falafel and hummus when we needed a change. There is no shortage of food options here and I found myself counting down the minutes to the next meal. Thai food in Thailand is completely different than what you’d get outside the country. The taste is fresher, more distinct and flavorful. Each bite hijacks your taste buds for a thrill ride. The food carts and gutter side eateries are often the most tantalizing. And there’s no shortage of ambience on the streets. John got to get some good bites in before heading back to the States. 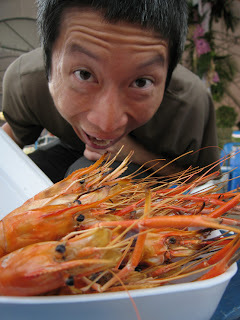 The jumbo prawns never had a chance. The narrow trails through the Himalayas are made of rocks and dirt, often covered in rain or snow depending on the elevation. There are no motorized transportation, except for the plane to Lukla and the emergency helicopter for the medical evacutees. That means the only way to get supplies throughout the network of villages is on the back of a yak or sherpa. Sherpas out number yaks about 50 to 1. Most people that show up here are on package tours that they arranged ahead of time back where it was warm. An incredibly few number of people attempt the trek without. We were weak and we knew it so when we arrived at Lukla we immediately found a sherpa. Nima, a 5’2″ small framed Nepalese, hauled our overstuffed XL duffel bag (about 50lbs) through the mountains while we only carried small day packs. He was always ahead of us, waiting for our slow bums to catch up. Nima came from a long family line of sherpas and started when he was 12 years old. He says that’s why he’s so short. He was deft and creative at tying bags with knots. His english was decent and doubled as our guide. Sherpas here make on average $8 a day here and during the high tourist months of Oct. and Nov. will traverse these trails 5 times. That made it kind of hard to complain too much about our single trip. During the off seasons the snow pours down on the Himalayas unrelentingly, and without a break so all the shops and guesthouses in the snow zone lock up and head lower. When I asked him what happens if you stay he replied, ”You die.” The money they make in the 4 months of tourisms pays for life the rest of the year and it was getting increasingly harder to find independent travelers looking for local sherpas. Nima was literally the back bone of our trip and an ideal companion for these rugged mountains. I was sad that there was no way to recommend him to others as he had no email and no phone. Not showering for 2 weeks wasn’t as bad as I had thought. Sure there were showers available but they were outdoor and the stream fed water w ould’ve snapped my hair off. The occasional wet wipe was good enough. For the entire 14 days we were constantly freezing so we never took off our base layer except to quickly change once at the half way point. Well, some of us did. I think the socks probably took the hardest hit. You know it’s been a rough hike when you can see the smell wafting off your feet. Really. It wasn’t until we were back in the warmth of Kathmandu that we showered and for the first week our skin slowly sloughed off several layers. It was like we were shedding two weeks worth of skin and dirt all at once. We stumbled upon just a couple nice bathrooms. Indoor, porcelain and with a door! Here’s one of the most beautiful outhouses in the world, but you really did not want to get stuck going out to it in the middle of the night. Although somebody “smart” propped their tent right next to it. Yak dung is brown, but it’s gold. It’s lovingly hand shaped into convenient patties for drying. Their uses are universal; from making walls, to indoor carpeting, to beds, and most importantly stove fuel. Ah, the smell of yak dung meant warmth. Of course we tried desperately not to notice that the same hands handling the patties then went directly into the kitchen to take care of our dinner. That was one of those taboo subjects. If only we could’ve eaten that well the entire 2 week trek. But the culinary offerings of Namche Bazaar is far and away the exception in this the largest and lowest town on the beaten path. Our Himalayan vacation was largely powered by egg and toast in the morning, instant Rara noodles for lunch, and the local lentil soup called dahl bat for dinner. All this was washed down by hot tea, hot lemon, or boiled water. Every guesthouse had the same bland items. After the first few days we started eating as a chore. Though we’d be starving after a six hour hike uphill we’d pick at our food just enough to stave off hunger yet another night. At the base of Mt. Everest we were treated to a left over bag of chili mix from a previous expedition. Of course the local Nepalese cooks hadn’t the faintest idea of what to do with it so I squandered my way into a kitchen, not that I knew how to make RV food but atleast I could read the instructions. We had brought a weighty bag of snacks to offset our limited diet. The snickers bars, skittles, sour lemon drops and sausages were all highlights in our daily regiment.We semi-unfortunagtely learned that skittles, lemon drops and happy cola combined under heat and pressure mutate into a single gelatenous brick of pure sugar. Of course, that didn’t stop us from gnawing on the brick as Mary demonstrates here. Oh sure, along the road up snacks like crackers, canned fruit, and chocolate could be found but at $5 per snickers we were glad we bought our own. Even with this gold mine of snacks our daily intake of calories were well under the amount spent traversing the mountains. Over the 14 days we lost at least 10lbs each, with Steve being the most drastic with his 20lb loss. We were all swimming under layers of wool and goretex. So even with our gorgings on Yak sizzler and gorgeous chocolate cake during our two stops at Namche Bazaar our 2 week circuit that took us above Everest Base Camp was an awesome weight loss program. The bonus was walking away with legs of steel. Cold weather causes tremendous shrinkage in the life of a battery leaving it with only 10% of its normal usage. We confirmed this during our trip to the Harbin Ice Festival 2yrs ago. Thus the livelihoods of our combined 3 cameras were at risk. ‘Isn’t there electricity in the Himalayas?’ you ask. The answer is sort of. The ‘fancier’ guesthouses have a single 15watt bulb in the common eating room that they light from 6-9pm. Outlets? Never saw one. But some entrepreneurial spirits have brought a handful of solar panels to supply tourists with their precious juice. So anyone wanting a charge could pay $5/hr. Just hope your battery recharges quickly. Even then people were only getting half charges due to questionable wiring. But that’s why we bring someone along with too much time and no sensible fear of electrical fire hazard. When John first walked off the airport bus way back in Beijing my first question to him was ‘What’s that on your back?” He looked like a Teenage Mutant Ninja Turtle living in the Matrix. But that’s how solar panels on your back are going to change your image. Oh sure there were the common enough glares by locals and tourists alike. They spat out questions like ‘What is that?’, ‘Does it work?’, and ‘Is that what I think it is?’. And yes, it worked like a charm. Even came with a built in flashlight. We put in a request that next time he jerry rig a heater, or air conditioner as befits the environ.